Members of the diaspora who gathered in Moscow on Thursday for the Forum of Russian Compatriots welcomed President Vladimir Putin’s recent edict to support remote Russian language-learning amid efforts in their home countries to limit the status of their mother tongue. However, attendees also voiced doubts that the language programs will help draw young Russians back to their traditional motherland. In his annual state-of-the-nation address Wednesday, Putin told the government to support Russian schools abroad through such measures as providing textbooks. Russians abroad can now register for free online courses that allow them to go through Russia’s school curriculum. They are given a certificate after passing the final exam. Successful completion of this program makes it easier for students to then pass Russia’s general exams and apply to a university here. Tatyana Kuzina, chairman of the Slavic Cultural Center in Kazakhstan, welcomed Putin’s effort. Only the Kazakh language holds official status in the country, but there are at least 5 million Russians in the country of 16 million people. Russian is the main language of communication for everyone, she said. The Kazakh government is now trying to limit the influence of Russian. In March, students are expected to be tested on their knowledge of Kazakh. Kuzina said that will be a difficult challenge for the few remaining Russian schools in the country. After 2015, all education is expected to be given in the Kazakh language. Remote education will help Russians in Kazakhstan retain their mother tongue and encourage more of them to move back to the country, Kuzina said. 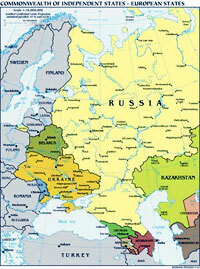 She estimated that about 93 percent of people who go through the remote learning process move to Russia. “Today, we will really attract the best minds to Russia,” she said. But representatives of diaspora groups in other countries expressed doubt that young Russians will move back. Russians in Latvia are more interested in getting Russian citizenship than Latvian, said Viktor Gushin, coordinator of Latvia’s Council of Public Organizations. But most of the 40,000 Russian citizens living in Latvia now are from older generations. They see a better pension as one of the main advantages of Russian citizenship. Younger people are less motivated to become Russian citizens or move to the country. While older Latvians tend to speak Russian fluently, the younger generation doesn’t know the language at all, Gushin said. About 120 young Latvian residents with different citizenship status go to Russia each year for the free education they are offered, but many others move to the West, he added. Yusuf-zade Gaig Yusufovich, president of a Baku-based charity fund that works with Russian expats, said trading in an Azeri passport for a Russian one would not be worth it. Even if an expatriate Russian is offered work here, the bureaucratic process can take so long that by the time he arrives, the employer will have given the job to someone else, Yusufovich said. He added that he doesn’t know many people in Azerbaijan who want to move to Russia.